A gentle display of pink roses seems to float on a cloud of feathery Queen Annes Lace. This daydream of a bouquet is simple, but wonderfully pretty. 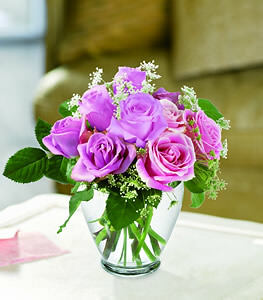 A clear glass vase, featuring a mix of medium and light pink roses and Queen Annes Lace. The flowers were indeed much fresher and better arranged. Thanks for your attention. Appreciate it.